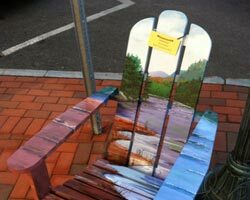 Next time you're strolling through the streets of downtown Glens Falls checking out the shops, restaurants and artwork, Have A Seat! 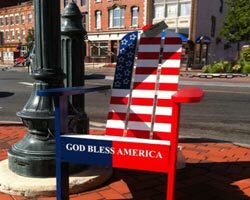 From now until Labor Day weekend - 35 whimsical, wacky, and beautifully detailed chairs will be displayed on sidewalks from Centennial Circle up Glen and Ridge Streets. 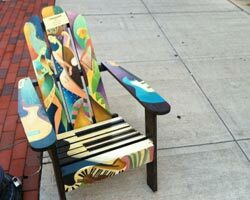 Each chair was created by a regional fine artist and reflects why Glens Falls is such a special place. The first Adirondack chairs were designed in 1903 by a man named Thomas Lee. Lee had a summer home in Westport, NY, and while on vacation with his family, he realized that there was a severe shortage of patio furniture. After trying several different designs, and gaining valuable feedback from the 20+ people in his family eager to sit down, Lee came up with the straight back, wide arm-rest style that we know today. All of the wood used to construct this chair could be cut from a single piece of lumber. In 1904 Thomas Lee showed his new creation to a carpenter in town, Harry Bunnell. Bunnell saw the potential for profit in Lee's design, and applied for a patent under the name Westport chair. In 1905, Harry Bunnell obtained the patent for what would become one of the most recognizable pieces of furniture ever, without Thomas Lee even knowing. Bunnell's Adirondack chairs were made entirely of hemlock, were painted either dark green or brown, were signed by Bunnell and were sold for $4.00 each. The design has long since been adapted by furniture makers, and Adirondack benches, gliders and rockers can be found around the country in countless different colors and styles. On Wednesday, September 14, after you've had your chance to pick your favorite, the chairs will be auctioned off! Auctioneer extraordinaire Martin Seelye will be hosting a lively auction at the Wood Theater from 6:30 - 9pm, admission is free and the event is open to the public! Bidders should be prepared to take their chair(s) with them at the conclusion of the auction. Absentee bids will be accepted live by phone during the auction. To make the necessary arrangements, call 798-1144, ext. 5 prior to 5pm on Monday, September 12. Absentee bidders will need to provide a valid credit card number, and will have one week to pick up their new chair. Shipping is not an option. 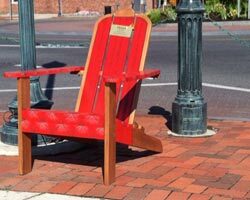 Proceeds from the 'Chair-itable' Auction will go to City Park Restoration Project, Crandall Public Library, Lower Adirondack Regional Arts Council, and the wonderful chair artists.